You, Me and Movies: Review: "Daddy's Home 2" is an unfunny holiday romp suffering from an identity crisis. 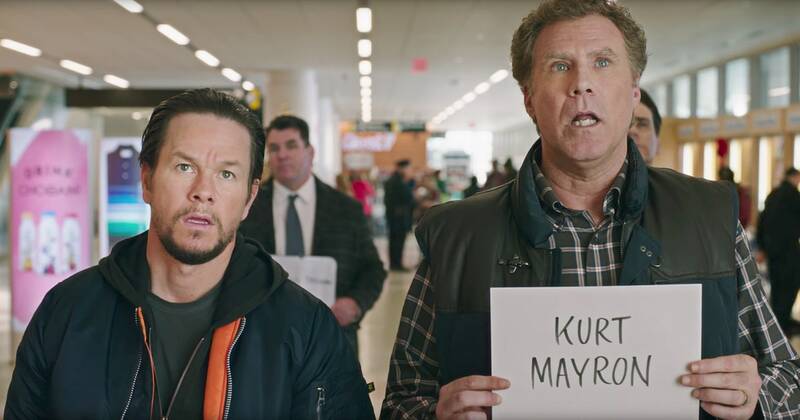 Review: "Daddy's Home 2" is an unfunny holiday romp suffering from an identity crisis. It was a little before halfway through “Daddy’s Home 2” that I felt as if I was suffering from déjà vu. I understood why. I watched “A Bad Moms’ Christmas” a few weeks ago and now I am watching “Daddy’s Home 2,” essentially the same movie but the gender of its lead actors reversed. Both feature people getting ready for a big Christmas holiday, both feature lead characters who have a parent of the same gender they are dreading, both feature the whole coming together for a crazy Christmas holiday, both feature a Hallmark Christmas style moral lessons and everyone understands each other at the end. They are basically the same movie, so if you haven’t seen either of them, I’d say flip a coin and whichever film you assign heads or tails is the one you see. Although, telling from the trailers for both movies, you already know yourself whether or not you want to see either film. I never saw “Bad Moms” so I only had “A Bad Moms’ Christmas” to judge. “A Bad Moms’ Christmas” was fine, but featured too many montages and wasted its talented cast. “Daddy’s Home 2” doesn’t really have any montages, but completely wastes its cast. There is no reason for a film featuring Will Ferrell, Mark Wahlberg, John Lithgow, Mel Gibson, and Linda Cardellini to not be funny. There isn’t a single actor in this entire movie that doesn’t have a good witty line or a fantastic scene of hilarity. It goes deeper than that though. This is a movie that bulldozes through half a dozen different story threads and sometimes doesn’t finish them or does, but in the most half-assed way possible that the film feels disjointed. “Daddy’s Home 2” doesn’t know if it wants to focus on men with daddy issues, or how families sometimes keep secrets from each other during the holidays, or how children are affected by step-parents and co-parenting or how children can be negatively affected by divorce and separation. This is all tricky terrain to navigate for a drama, so when someone tries to construct a comedy on these themes, that’s even trickier. A smart screenwriter could possibly write a smart, thought-provoking comedy around these themes and still make something crowd-pleasing and entertaining. Unfortunately, it doesn’t seem like screenwriters Sean Anders and John Morris only aimed for the easy targets, while bringing up some big issues without exploring them. Don’t let the story fool you, this is a slapstick comedy that never fully explores its characters. If its slapstick you want, its slapstick you are going to get. But I can’t promise any of the comedy will land. Always telling when watching a comedy is how often I laugh, and I personally have a broad sense of humor. I am almost thirty and still laugh at fart and poop jokes. It doesn’t take much to get me red-faced with laughter, so when an hour and half rolls by and I never cracked a smile, its jarring. Especially with all the funny people in this. I love Will Ferrell. I love John Lithgow. I love the comedy they can produce. Hell, even Crazy Mel can produce some big laughs when given the right notes and direction. Nobody has any memorable dialogue here, nobody has one good line. The film relies heavily on shock humor and slapstick to push the audience along, it is humor for the lowest common denominator. I never reviewed “Daddy’s Home” on my site. I never got a chance to see it during its theatrical run and I never caught up with it until it reached DVD. I found it to be woefully ordinary, not something that warranted a sequel. But with the cast they brought together for this, I figured they were going to throw the kitchen sink at the wall with humor. Sadly, “Daddy’s Home 2” is an unfunny, holiday romp that seems to be suffering from an identity crisis depending on what else you’ve seen at the theater this holiday season. Trailer Two of "Ready, Player,One"
Baby Driver 2? Edgar Wright says yes!